Erosion is the transportation of the mineral components of a rock away from the previous location of deposition, as facilitated by geomorphic processes. The term erosion may also refer to movement or depletion of soil and sediments. Common erosive agents include water, ice, wind, plants, animals and humans. The rate at which erosion occurs depends on the intensity of the surface processes present as well as the degree of slope the rock or sediment is resting at. Erosion may occur slowly over time (imagine the slowly changing course of a river), or in dramatic events where large amounts of material can move at once (think of a landslide, debris flow). Although erosion is natural process and is an important part of the Earth cycle, the human population and expanding impacts of civilization have caused an increased global rate of erosion, leaving land degradation as one of the most important issues to solve in agriculture today. Physical erosion is the most common type of erosion, which involves the transportation of clastic sediments from one location to another. In physical erosion, a rock is broken down into pieces ranging from clay size to boulder size, and subsequently moved from one location to another with the help of surface processes. The size of the sediment and distance transported depends on the energy levels provided by erosive agent. A low energy event such as wind will be able to move sand-size particles a short distance, maybe a long distance over time, but is unlikely to move any cobble-size pieces at all. A high energy event like a coastal storm may be able to move entire coastlines in one episode, as well as large boulders, entire trees or even homes. Chemical erosion is facilitated by a solvent (typically water) and involves the actual dissolution of the mineral components of a rock, allowing them to be transported “downstream” or wherever the solvent is headed. Mineral components may precipitate out of the solvent when conditions allow for it, depositing the eroded minerals in a new location. Chemical erosion happens most commonly with minerals that are easily dissolved in water, such as calcite, halite and other evaporate minerals. Water is a major erosive agent, and contributes to the transportation of sediments in as many ways as there are sources of water on Earth. Rainfall contributes to several common varieties of erosion such as runoff, flooding, gully and valley formation, mass wasting. Runoff is an important kind of erosion in cities, where every time there is rainfall there is litter, dirt, chemicals and sediment washed into sewer systems and eventually the nearest body of water. Runoff contributes to the eutrophication, or, ecological death of lacustrine, fluvial, and coastal environments. Most people are familiar with the Grand Canyon, which has been formed by the dramatic erosion of sedimentary rock by the fast moving waters of the Colorado River, resulting in steep canyon walls that seem to go on forever. The same processes of erosion that created the Grand Canyon are constantly at work wherever there is rainfall, forming channels and gullies that cut into rock and sediment. In cities, this same process causes damage to concrete and asphalt and is the reason our roads need to be repaired every few years. Mass wasting describes an event where large amounts of soil, rock and sediment are moved primarily by forces of gravity, but are assisted by water content controlled by rainfall. Types of mass wasting include landslides, debris flow, rock fall, creep and slump. Mass wasting occurs when the force of gravity overwhelms the resisting force holding up the mass, often on a steep slope. These events can take place in a matter of seconds or over the span of decades. The shape of continents and landforms on Earth have been greatly affected by the advance and retreat on ice sheets consistent with global climate cycles that have taken place over the last 2.6 million years. When an ice sheet advances, it scours the rock below and with its great mass pulverizes rock into sediment that may continue to move with the ice sheet or be pushed around below. When the ice sheet retreats, it leaves these deep scours behind, dramatically altering the landscape. This process formed the Great Lakes at the end of the last glacial period, when the scours formed by the Laurentide ice sheet subsequently filled with glacial melt as it retreated. Wind is an erosive force that generally does not result in dramatic erosive events but over long periods of time can cause drastic change to landscape and is a contributor to desertification and land degradation. The impact of wind erosion is greatest in arid regions, and increases significantly in times of drought. Wind can facilitate erosion simply by picking up soil or sediments and carrying them away, or it can facilitate abrasion, in which particles carried by the wind are thrown into surfaces that eventually become worn down. Simply by leaving footprints, all animals that walk the Earth are contributing to erosive processes. 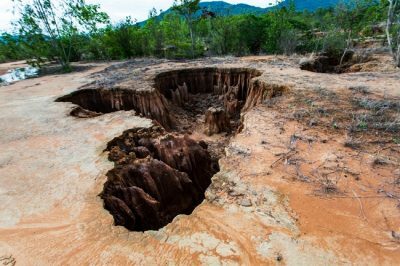 Humans have escalated their contributions to erosion by intensive manipulation of vast areas of land. Cities and concrete make an enormous contribution to land degradation, but agriculture is maybe considered the most significant human impact. When one kind of crop is grown intensively across one vast area (known as monoculture), the entire layer of topsoil becomes loose and depleted, making it more likely to erode in a rainfall event or be carried away by the wind. Deforestation is the act of clearing forests of all vegetation in order to make way for agricultural, urban, or natural resource development. Since trees and other plants hold soil and sediments in place with their roots, the removal of these factors significantly increases the vulnerability of the topsoil to erosion. Many of America’s beloved National Parks boast unique geologic features that attract millions of visitors every year. These natural wonders have been carved out of the bedrock by surface processes for a time far beyond what humans can comprehend, and are still involved in those processes today. If you visit the sandstone desert of the American Southwest, you’ll be sure to see several kinds of natural sculptures, all which have been formed by erosion. Arches, Canyonlands, Bryce Canyon, Zion and Capitol Reef National Parks, as well as Natural Bridges, Grand Staircase-Escalante and Bear’s Ears National Monuments and Goblin Valley and Goosenecks State Parks are all parks that were created for their access to interesting products of erosion in Utah alone. For a more detailed look at how erosion plays a role in sculpting different geologic features, follow this link. Here we can see an example of how wind, water, ice and chemical erosion all play a role in the formation of fins, hoodoos and arches. Other National Parks that feature a unique geologic history of erosional processes include Badlands in South Dakota, Yosemite in California, Carlsbad Caverns in New Mexico, Big Bend in Texas, Black Canyon of the Gunnison and Great Sand Dunes in Colorado, and of course the Grand Canyon in Arizona. 1. Which of the following is not an erosive agent? 2. What determines the rate of erosion? 3. What human activity contributes the least to accelerated rates of erosion?